I received a second update saying Medallion Transport will enter the Cebu-Surigao route starting tonight. In prior days, only Cokaliong Shipping Lines Inc. (CSLI) was serving this route which was for long a bread and butter route for them after Carlos A. Gothong Lines Inc. (CAGLI) and Aboitiz Transport System (ATS) abandoned this route. James Verallo told me it will be the Lady of Love which will be doing the Cebu-Surigao route for Medallion Transport. The Lady of Love is the biggest and best ship of the company and its size at 88 meters is really of the size of the Cebu to Northern Mindanao ships. 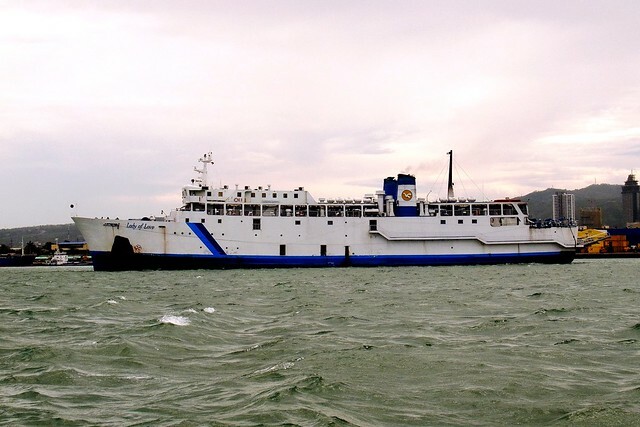 Besides the size, this overnight ferry has good amenities because she had been a Manila to San Jose, Occidental Mindoro and a Manila to Roxas City ship of Moreta Shipping Lines in the past. She also has the speed because she is still capable of 15 knots cruising speed if fuel economy is not a consideration. In entering the Surigao route, I am enthralled by the boldness of Medallion Transport. Its Cebu predecessors in expansion which are Roble Shipping Incorporated and Lite Shipping Corporation or Lite Ferries have been tiptoeing for so long now in trying to reach the Northern Mindanao ports. Lite Ferries was able to reach Plaridel in Misamis Occidental but I don’t consider it a major Mindanao port while Roble Shipping still are not able to reach Oroquieta in Misamis Occidental after all their announcements and the naming of a ship after the place and this is their Oroquieta Stars. Lite Ferries was able to get to Cagayan de Oro with the old Lite Ferry 8 which is a little outgunned by the overnight ferries of Trans-Asia Shipping Lines, Inc. (TASLI). Meanwhile, Roble Shipping can’t seem to reach Nasipit although they have a CPC (Certificate of Public Conveyance) or franchise there for many years already. Now here comes Medallion Transport without tiptoeing (and prior announcement) and even though it seems they lack true overnight ferries. Oh, well, they were able to reach Masbate before and operate in Bicol waters while Lite Ferries and Roble Shipping seem to have difficulty in going out of the confines of the rather tame Camotes Sea. Maybe Medallion Transport have some supply of “braveness pills” which the others don’t have. Certainly, I welcome the move of Medallion Transport. It is time that the two shipping companies to Northern Mindanao ports (Cokaliong and Trans-Asia) have added competition to keep them on their toes (especially since Cebu Ferries has become the “Batangas Ferries”). I will even welcome if they go as far as Western Mindanao like to Zamboanga. Our country needs boldness from the shipping companies. It is one characteristic I have long found wanting in them since “The Great Merger” (the creation of the late WG&A and Cebu Ferries) bullied them in the late ’90’s and that was two decades ago already. I do not say they are not good but it is time to expand beyond Camotes Sea or in routes that are just in the 60-nautical mile range. Will Medallion Transport succeed? That remains to be seen but I certainly hope so. However, with this move Palompon will lose a very good ship and James Verallo is certainly unhappy with that. Well, the Lady of Love is the best overnight ship to Leyte and also the biggest and that was a puzzle to me since Palompon is not even in the Top 3 in Leyte ports. Maybe she was really too good for that route. I think the former HNSS ferry acquired by Medallion Transport will replace the Lady of Love in the Palompon route. Its size will be more in character with the route. Meanwhile, the Lady of Love might be more fit in a Vismin route. Actually it was not only me which thought that the size and speed of Lady of Love would have been better utilized if Trans-Asia Shipping Lines was able to acquire her but maybe Medallion Transport is really bolder than the said company. The Lady of Love has not been sailing for several months already waiting for engine parts from Japan. Maybe the parts and repairs have already been done and they are confident that the ship is already capable of the 111-nautical mile route to Surigao which double of her previous route to Palompon (double the route is the equivalent of a back-and-forth sailing to Palompon). What will be now the implication of her entry to Surigao? Before, Cokaliong Shipping Lines used their weakest ships in the route including their smallest, the Filipinas Dumaguete since they have no competition. Certainly, the company has some very good ships especially their newer ones. Now I don’t know if the Medallion Transport entry will trigger a reshuffle of their ship assignments. Whatever is the denouement, the Medallion Transport move is an intriguing one. I certainly hope it energizes the Vismin routes. The Lady of Love might have an impact bigger than the entry of Lite Ferry 8 in Cagayan de Oro which needed some discounting to get going. We better watch out for further developments. Jose Roble, the founder of Roble Shipping Incorporated originally was from Danao City. That city is the bastion of the Durano clan and and made to what it is by Ramon M. Durano Sr., one the Grand Old Men of Cebu politics. This was after he was lured by Philippine Presidents to move up north so political tension in Cebu will be de-escalated. They did it with industrial incentives, the reason why Ramon M. Durano Sr. was able to establish factories, plants and processing facilities and even a stake in shipping. The late Durano patriarch was good in building up people and that included people who made good elsewhere. That included the former Senator Alejandro Almendras (who first made good as Davao Governor), the former Davao Governor Vicente Duterte, father of the recently-elected President of the Philippines Rodrigo Duterte and Jose Roble. Jose Roble was first into cargo handling or arrastre (Roble Arrastre Inc.) until he ventured into shipping under the company Roble Shipping Incorporated. Roble Shipping is into cargo but what is more known by the public is their passenger operation. They started in 1985 with the cargo vessel Marao, a ship built in 1965. They converted the ship so it can also take in a few passenger and sailed it from Cebu to Hilongos. The year 1985 was the tailend of the Marcos dictatorship and it was a period of great political and economic crisis. It was actually a propitious time to start, but simply, as the shipping lines then of all kinds were under heavy stress and some were collapsing outright and some were also tottering. For the next twelve years Roble Shipping made passenger ship acquisitions that were very simple and very conservative (but they also bought a few cargo ships). Always, the mark of their acquisitions in this period were the ships they bought were hand-me-downs, old and about ready for the breakers. Early on, tt just seemed to me that they were just one step ahead of Ting Guan, the biggest and legendary scrap metal dealer in Cebu which also buys ships as scrap (the good thing about Ting Guan is they just buy ships that have no more place to go unlike the China and South Asian breakers). Those were wise moves. If the acquisition failed it can just be sold for scrap with almost no loss compared to the purchase value. Meanwhile, it might even earn and gain recognition for Roble Shipping. That period of the late 1980’s was actually also good for starting in shipping because many shipping companies has already gone under and the former workhorses of our fleet, the ex-”FS” and ex-”F” ships were already in its last breadth and MARINA, the maritime regulatory agency was cracking down heavily on the wooden motor boats (locally called as lancha or batel). In 1986, Roble Shipping purchased the Don Bonifacio from Carlos A. Gothong Lines. This ship was the former Scorpius of the bankrupt NORCAMCO Lines which had routes to Romblon, Bicol and Northern Samar. Roble Shipping also acquired the former Surigao Transport of the tottering Sea Transport Company. Roble Shipping did the Marao treatment to her and added a small passenger accommodation and renamed her as the May Josephine. She tried the Cebu-Zamboanga route. Roble Shipping also purchased the Waka Maru from Manila Inter Ocean Liners. She became the first Hilongos Diamond. Her name already betrays her route. All of these ships were built in Japan in the 1950’s, a time when metallurgy was not yet advanced hence engine lives were not that long. The four along with Marao did not serve for any long time for Roble Shipping as they were already beaten up but the company was adept in buying a replacement when a ship of theirs was already in its last gasps. Roble Shipping was good in beating the last life out of a ship and in a sense that was good because in the earlier days one only sends a machinery to the scrap yard when it is already unrepairable. I think the penchant of Roble Shipping in keeping many ships in Mandaue Pier 7 might have started from this – just send in the ships that can sail from a fleet with many old reserves. In the years 1988, 1989 and 1990, Roble Shipping bought the overnight cruiser ferries being retired by Trans-Asia Shipping Lines Inc. (TASLI) which by then was already shifting to overnight RORO ferries. These became the Guada Cristy , Guada Cristy  and Queen Belinda in their fleet. These ships lasted longer than their earlier ships as they were not really that beaten up. However, Guada Cristy  was caught by the strongest typhoon to visit Cebu City in 1990, the Typhoon “Ruping” and was wrecked. Later the Queen Belinda also took the name of Hilongos Diamond. For a time these ferries from Trans-Asia Shipping Lines formed the backbone of Roble Shipping. 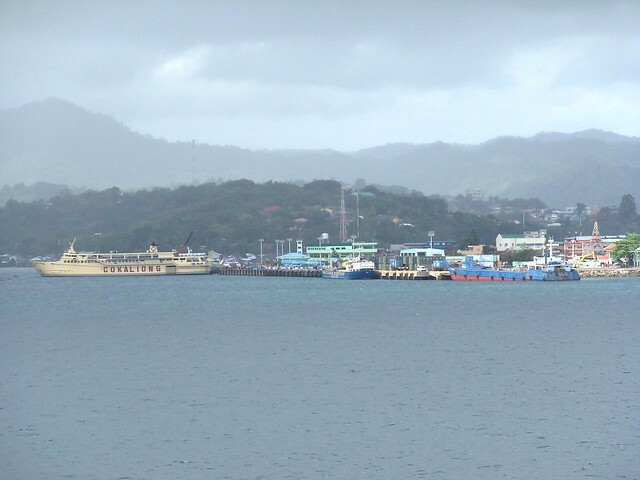 Later, in the mid-1990’s Roble Shipping Incorporated acquired the cruiser ferries being retired by Cokaliong Shipping Lines Incorporated (CSLI) in favor of RORO ferries. This is the second time Roble Shipping became the recipient of cruiser ferries being retired. Cruiser ferries have nowhere else to go at that time with the possible exception of Zamboanga so such moves by Roble Shipping extended their lives. These ships became the Leyte Diamond and Cebu Diamond in their fleet and being not beaten up served Roble Shipping well. In the late 1990’s, Roble Shipping also acquired the Ormoc Star and this ship became very associated with the company. At this decade Roble Shipping was undoubtedly the cruiser ferry specialist of Central Visayas. However, in the midst of all these cruiser ferry purchases, one grand ferry, a RORO big and good enough to be a liner came into the fleet of Roble Shipping Incorporated. This was their first RORO ship and she was called the Southern Queen. She arrived for the company in 1997. The Southern Queen was no ordinary overnight ferry. From her size, her origin as a Kansai Kisen ship with a classification as cruiseferry and her appointments she can match the best of the overnight ferries in the premier Visayas-Mindanao route, the Cebu-Cagayan de Oro route. She was so good I was even wondering what was she doing in the Roble fleet, no offense meant. I thought she was to be used in the Cebu-Nasipit route, for which Roble Shipping Incorporated is a holder of a Certificate of Public Convenience (CPC) which is otherwise known as a franchise. The Southern Queen was first known as the Maya Maru in Japan. She was ordered by Kansai Kisen KK from Hashihama Zosen and she was delivered in June 1971. She was built in the Hashihama yard and she measured 89.3 meters by 14.6 meters with a gross register tonnage (GRT) of 3,228 and a deadweight tonnage (DWT) of 508 tons. Maya Maru was a steel-hulled ship with a raked stem and a retrouvaille stern which looks like a transom stern slanted forward. She had a forward mast and a center funnel that was also the stern mast. The ship also had a false funnel at the center which was also an observation and functions deck. The original passenger capacity of Maya Maru was 1,000 passengers in three passenger decks. The ship had a stern ramp for vehicles and a car deck. Her superstructure encompassed the whole ship so there is no side passageways. Almost the entire passenger area of the ship was airconditioned. She was equipped with two Pielstick engines built by Ishikawajima-Harima Heavy Industries Company which is more popularly known then as IHI. This pair of engines produced a total of 8,400 horsepower and that was shafted to two screws. This gave the ship a top speed of 21 knots originally. In 1979, Maya Maru was transferred to Sogo Lease KK and she became a cruiseferry with no change of name. She was paired with three other cruiseferries. One was the Sunflower 1, a sister ship of Mabuhay 1 and Princess of New Unity and two other cruiseferries which became known here as the St. Francis of Assisi and Our Lady of Lipa (now, those three is regal company). In 1997, the ship was transferred to Roble Shipping Incorporated where she became the Southern Queen. Under this company the interior was renovated so that she will become an overnight ferry. Bunks were fitted along with a big cabin for the Tourist Class. Since the ship originally had a nearly fully-enclosed superstructure there was not much space where to build an open-air Economy Class except to modify the top deck somehow. The original cabins of the ship were more or less retained as Cabin and Suite Class. The wide functions areas and restaurants of the ship were practically removed but a front desk and a lounge was retained. In refitting her, although no part of the superstructure was removed, the gross tonnage of the ship went down to 1,598 nominal tons which was an impossibility. Again the MARINA “magic meter” was at work. Her declared net tonnage or NT was 978 nominal tons and the deadweight tonnage (DWT) went down to 478. Her route was Cebu-Ormoc and she was the biggest, most beautiful, most luxurious ship and speediest in that route. Her deployment was a big factor in the establishment of Roble Shipping as a force in Visayas shipping. No longer was she a simple receptor of hand-me-downs. In fact from this time on, they no longer bought a ferry from other companies except when the Cagayan Princess and Cebu Princess of Sulpicio Lines were offered to them under exceptional circumstances and price. And the two was laid up for long in Mandaue Pier 7 as the wont of Roble Shipping before and even now. In 2002, Southern Queen was renamed as the Heaven Star. Southern Queen/Heaven Star sailed for Roble Shipping for about a decade until her engines became balky and unreliable. With that development she began spending more time moored in their wharf in Mandaue. Initially, Ormoc Star substituted for her but when the Wonderful Stars arrived in 2007 and took her route I smelled the beginning of her end. She might have been fast but speed is really not a big asset in the Cebu to western Leyte routes which average less than 60 nautical miles in distance. Wonderful Stars might not have been as big as her but she has more than enough passenger and cargo capacity and speed good enough for dawn arrivals. However, with an engine horsepower of exactly half of Heaven Star, she is more of a winner. Heaven Star‘s engines actually has a reputation for being thirsty. After a few years of not sailing Heaven Star was slowly broken up in Roble wharf in Pier 7 in Mandaue starting in 2010. The process took until 2011 when only her hulk remained. We heard the sale of her steel was used to fund the rehabilitation of the two ferries from Sulpicio Lines which became the Theresian Stars and Joyful Stars in their fleet. Heaven Star might have been completely gone now but her donee Theresian Stars and Joyful Stars are still sailing for Roble Shipping. Now Roble Shipping is one of the Visayan overnight ferry majors. Really, it doesn’t matter where or how one started, as they say.